Easy Chess 2, 2 player games, Play Easy Chess 2 Game at twoplayer-game.com. 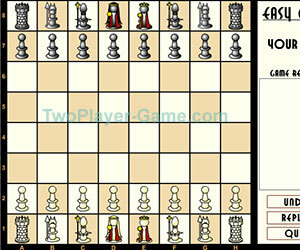 Two player Chess game.Chess is an abstract strategy board game and mental sport for two players. The object of the game is to checkmate the opponent's king. This occurs when the king is under immediate attack (in check) and there is no way to prevent it from being captured on the next move. Chess is one of the world's most popular board games; it is played both recreationally and competitively in clubs, tournaments, online, and by mail or e-mail (correspondence chess). Many variants and relatives of chess are played throughout the world. The most popular, in descending order by number of players, are xiangqi in China, shogi in Japan, janggi in Korea, and makruk in Thailand. The game described in this article is sometimes known as FIDE Chess, Western Chess or International Chess to distinguish it from other variants.